superior to any other repirometer. upon startup. Test results in minutes. and the scrubber.The entire air system is closed to the atmosphere. 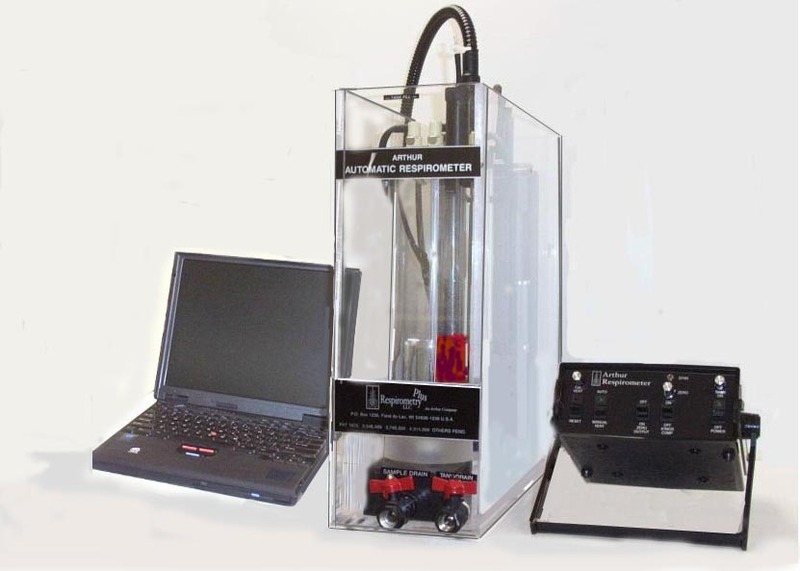 instrument produces a continuous graphical record of respiration. The Sample Chamber, CO2 scrubber and Respirometer module are connected to each other with tubing and quick disconnects. 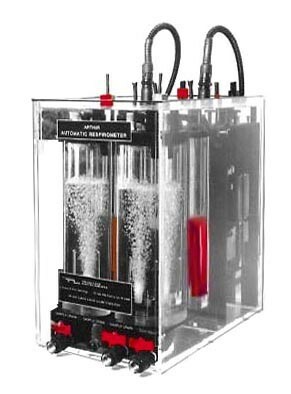 Sample Chamber...The instrument is normally furnished with a two-liter cylindrical chamber, but various sizes and shapes are available. On the removable top of the Sample Chamber is a fill tube closed with a threaded plug. The plug is fitted with a syringe connector for calibration. Sample Chambers can be removed and disassembled to clean. When installed, each Sample Chamber is connected to a valved drain. With liquid samples the chamber utilizes an airlift pump to aerate and mix the sample. Air is distributed at the base of the airlift column through a fine bubble diffuser. Solid samples are usually placed on a porous stage and the air flows up through the stage. Respirometer Module...This rectangular shaped module is located behind the Sample Chamber and CO2 Scrubber Chamber in the waterbath. It consists of an assembly frame with volumetric transducer box attached, an air reservoir and foam trap, an automatic gas exchange system box and an air pump box. The air reservoir and foam trap, gas exchange system box and the air pump box can be easily removed from the assembly frame. A drain is provided to remove the oil from the volumetric transducer. respirometer module, sample chamber and CO2 Scrubber. Temperature control can be obtained by using an Immersion Heater in the waterbath. Cooling can be provided with an Immersion Chiller. The Electronics Module...All controls to operate the respirometer are contained in the electronics module. This includes a power switch with indicating light, on-off switches for atmospheric pressure compensation, automtic venting and zero and span adjustment controls. The respirometer is calibrated by withdrawing a prescribed amount of air with a calibrated syringe. except the Echopod which is warranted for 12 months. 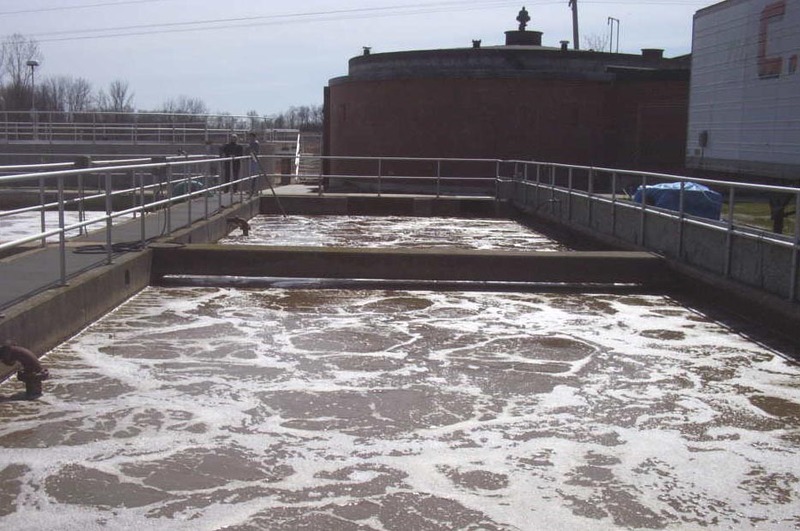 following patents: 3,348.409; 3,740,320; 4,314,969; or 4,650,767.
have in-depth knowledge of the activated sludge process.